We are a private Bee Removal Company, we are a paid service and we DO NOT rescue injured animals or handle Domestic Animal issues. Bee season is here and the population is growing! This is when Bee Removal and Control services will become important to the citizens of Altadena. Honey Bees, Wasps and African Killer Bees will be on the move looking for places to make a hive. 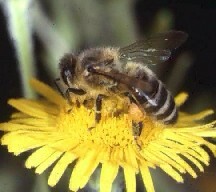 We get calls everyday about bees making a hive in the eve’s of homes in Altadena. this is a common place for bees to make a hive, but can cause more problems for the home owner if not taken care of. Bees will almost always find their way inside the eve of your home and gain access to your attic. This is not a good situation because now the bees are inside your home in Altadena. You should call a Bee Removal Professional when you notice a Bee Hive that is attached to your home, because the hive will only get bigger. The queen bee can lay up to a thousand eggs a day. Bees are very aggressive when they have a hive to protect. This is why it’s important not to try to remove or spray a hive yourself. You may only see 20 or 30 bees outside the hive but there are hundreds inside that will attack you if disturbed. Our Bee keeper can remove the bees and the hive safely so no one gets stung. Killer Bees look very similar to Honey Bees but are much more dangerous than a average bee. Killer Bees will chase a person for blocks in Altadena while stinging you the whole time. This is why you should call a Bee Removal professional if you don’t know what type of bees you are dealing with! Our bee keeper always tries to remove the bees alive if possible and relocate them where they can do some good for the farmers in Altadena. This is a big part of Bee Control in California. If you discover a large ball of Bees on your property in Altadena but don’t see a hive, this is called a swarm. Bee Swarms are commonly found in a tree or bush. They will usually form a big ball and just stay there and rest. Bee Swarms are Bees that split from the hive because it became too crowded. These Bees aren’t as aggressive because they have no hive to protect. Bee swarms will usually only hang around for a day or so and move on. If you have a swarm that’s been there for more than a couple of days, then this is a good time to call a bee removal professional to have it removed before the Bees establish a hive on your property in Altadena. It will be much cheaper for a home owner to have a swarm removed rather than a hive because the Bees won’t be as aggressive when the Bee keeper removes them.